… And by “WOW!” I mean: Wow, I need to use these with my students. OR …Wow, I need to share these with my colleagues. OR Wow, I am inspired to develop my own digital history project. Of course a synthesis of all 3 is the sweet spot. That was the course of action leading to the development of my US History in a Global Context project. 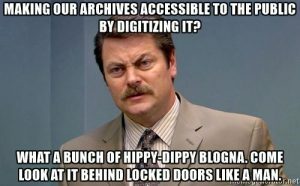 What is digital history? Indeed, defining your terms is usually a great place to start. I have found these explanations to be useful and bring moments of clarity which ultimately furthers the conversation and utility of these types of projects. I have had the pleasure of working on multiple digital history projects. So, let’s look a bit further and see what formats digital history projects can take. In short, when we discuss digital history, we can be referencing a number of types and purposes. The common aspects being that they are accessible to the public and organized around a theme(s). This list comes (in part) from the Organization of American Historians. Archive: a site that provides a body of primary sources. Could also include collections of documents or databases of materials. Essay, Exhibit, Digital Narrative: something created or written specifically for the Web or with digital methods, that serves as a secondary source for interpreting the past by offering a historical narrative or argument. This category can also include maps, network visualizations, or other ways of representing historical data. Teaching Resource: a site that provides online assignments, syllabi, other resources specifically geared toward using the Web, or digital apps for teaching, including educational history content for children or adults, pedagogical training tools, and outreach to the education community. Podcasts: video and audio podcasts that engage audiences on historical topics and themes. Games: challenging interactive activities that educate through competition or role playing, finding evidence defined by rules and linked to a specific outcome. Games can be online, peer-to- peer, or mobile. Wonderful! With classrooms having access to computers and moving to 1:1 formats, quality digital resources is in demand. The good news is that they are out there. But these are only good if they get used. To that end, I have curated a collection of digital history projects that are designed for high school and higher education history and social studies classes. These selections offer a variety of implementation pathways allowing immediate use with students (either in full or in part). Additionally, these would be relevant for history/social science methods classes. Here is one more general resource, a short video, to help frame and advance your understanding before you dive into the digital history resources. What project did I miss? What do you think of these? Let me know and contact the project designers so they know who is using the resource they created. Enjoy! 1. The 68.77.89 Project: Arts, Culture, and Social Change: Created by The National Czech & Slovak Museum & Library, this resource was just launched in early 2018! Students will be challenged to apply the lessons from the experiences of Czechs and Slovaks to better understand issues of democracy today and their responsibility for preserving democracy for the future. 68.77.89 is designed for students in grades 9-12. It provides a set of 12 learning activities in 4 modules that meet Common Core, Advanced Placement, and International Baccalaureate standards. The activities can be used as a set designed to be used together, or in single modules as free-standing lessons. Images of the 4 modules is below. 2. The Trans-Atlantic Slave Trade Database: This is a remarkable tool which synthesizes data with visualization formats very effectively. The database “has information on almost 36,000 slaving voyages that forcibly embarked over 10 million Africans for transport to the Americas between the sixteenth and nineteenth centuries. 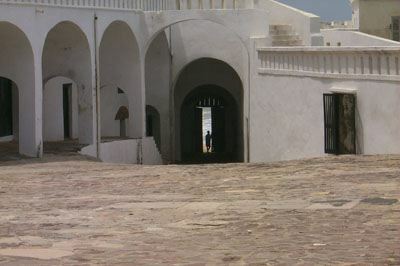 In order to present the trans-Atlantic slave trade database to a broader audience, particularly a grade 6-12 audience, a dedicated team of teachers and curriculum developers from around the United States developed lesson plans that explore the database. Utilizing the various resources of the website, these lessons plans allow students to engage the history and legacy of the Atlantic slave trade in diverse and meaningful ways. Here is one example of a search I did. 4. Our Shared Past in the Mediterranean: This is an intriguing world history curriculum. Given the unique geography of the transitions currently underway in the Middle East (several geographically contiguous North African states) and the likelihood that interactions between Europe, northern Africa, Turkey, and the Arab world will constitute a vitally important sub-region of globalization going forward, new cross-Mediterranean tendrils of economic and civil society connectivity will be necessary to help anchor these transitions. An outline of the modules can be viewed here. 5. Rethinking the Region: North Africa and the Middle East: Another contribution to the field of world history, this project “analyzed the common categories used to describe and teach the Modern Middle East and North Africa in existing World History textbooks. Based on this research, we offer robust alternatives for Grade 9-12 social studies teachers and multicultural educators that integrate new scholarship and curricula on the region. To this end, we examined the ways in which the region is framed and described historically, and analyzed categories like the ‘rise and spread of Islam,’ the Crusades, and the Ottoman Empire. Narratives surrounding these events and regions tend to depict discrete and isolated civilizations at odds with one another. To remedy this oversimplification, our work illuminates the manners in which peoples and societies interacted with each other in collaborative and fluid ways at different political and historical junctures. 6. 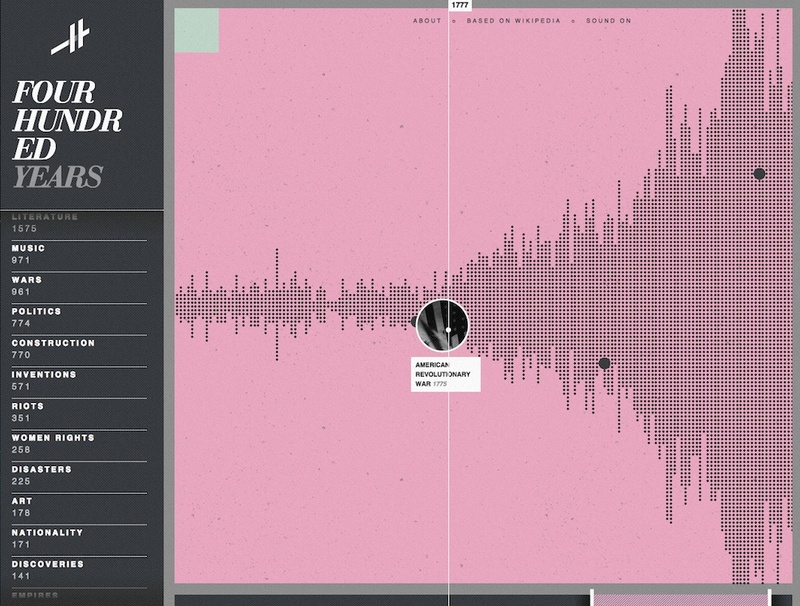 Histography: “Histography” is interactive timeline that spans across 14 billion years of history, from the Big Bang to 2015. The site draws historical events from Wikipedia and self-updates daily with new recorded events. The interface allows for users to view between decades to millions of years. The viewer can choose to watch a variety of events which have happened in a particular period or to target a specific event in time. For example you can look at the past century within the categories of war and inventions. Histography was created as a final project in Bezalel Academy of Arts and Design. Guided by Ronel Mor. Below is a screenschot of the platform. 7. American Yawp: “In an increasingly digital world in which pedagogical trends are de-emphasizing rote learning and professors are increasingly turning toward active-learning exercises, scholars are fleeing traditional textbooks… The American Yawp offers a free and online, collaboratively built, open American history textbook designed for college-level history courses. Unchecked by profit motives or business models, and free from for-profit educational organizations, The American Yawp is by scholars, for scholars. All contributors—experienced college-level instructors—volunteer their expertise to help democratize the American past for twenty-first century classrooms.” This is being used in high schools as well. Also, you can offer insights and edits for the editors to consider. 8. 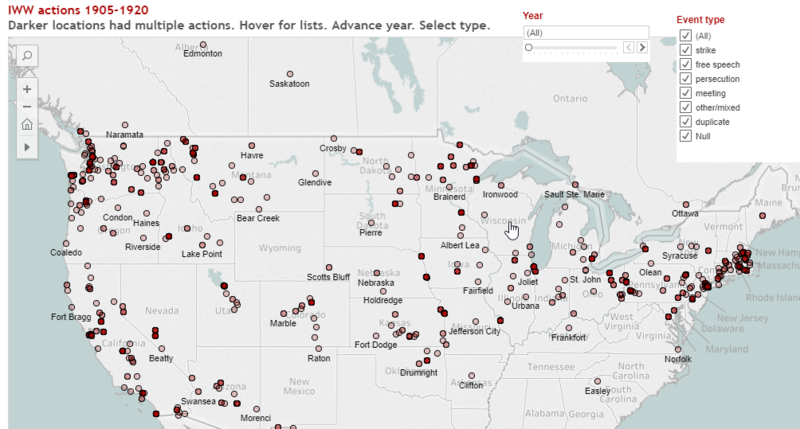 Mapping American Social Movements in the 20th Century: “This project produces and displays free interactive maps showing the historical geography of dozens of social movements that have influenced American life and politics since the start of the 20th century, including radical movements, civil rights movements, labor movements, women’s movements, and more. Until now historians and social scientists have mostly studied social movements in isolation and often with little attention to geography. This project allows us to see where social movements were active and where not, helping us better understand patterns of influence and endurance. It exposes new dimensions of American political geography, showing how locales that in one era fostered certain kinds of social movements often changed political colors over time.” The screenshot below shows a sample of an interactive map. Fantastic! 9. Eagle Eye Citizen: Made by the invaluable team at the Roy Rosenzweig Center for History and New Media, Eagle Eye engages middle and high school students in solving and creating interactive challenges about Congress, American history, civics, and government with Library of Congress primary sources. This helps develop students’ civic understanding and historical thinking skills. It is highly interactive and invites students and teachers to use existing challenges and develop their own. 10. Mapping the 4th of July: Mapping the Fourth of July is a crowdsourced digital archive of primary sources that reveal how Americans celebrated July 4 during the Civil War era. These sources reveal how a wide range of Americans — northern and southern, white and black, male and female, Democrat and Republican, immigrant and native born — all used the Fourth to articulate their deepest beliefs about American identity during the great crisis of the Civil War… Whether you teach at the college or high school level, your students will jump at the chance to learn about how a previous generation of Americans celebrated the Fourth. (Yes, there were fireworks!) These are engaging documents that open up big themes: North-South differences; the causes and consequences of the Civil War; African American experiences of emancipation. On our website you’ll find standards-based assignment guidelines that make it easy to integrate it into your courses. 11. Back Story: Incredible podcast focusing on American history topics in a range of contexts. The hosts are fun, informed, and engaging. BackStory is a weekly podcast that uses current events in America to take a deep dive into our past. Hosted by noted U.S. historians, each episode provides listeners with different perspectives on a particular theme or subject – giving you all sides to the story and then some. Also, a resources icon indicates that the episode has educator resources available. Use BackStory in your classroom! Just go to the episode archives and filter by episodes with resources. This resource feels like the “godfather” of digital history projects. “Since its establishment in August 1991, the Cold War International History Project (CWIHP) has amassed a tremendous collection of archival documents on the Cold War era from the once secret archives of former communist countries. 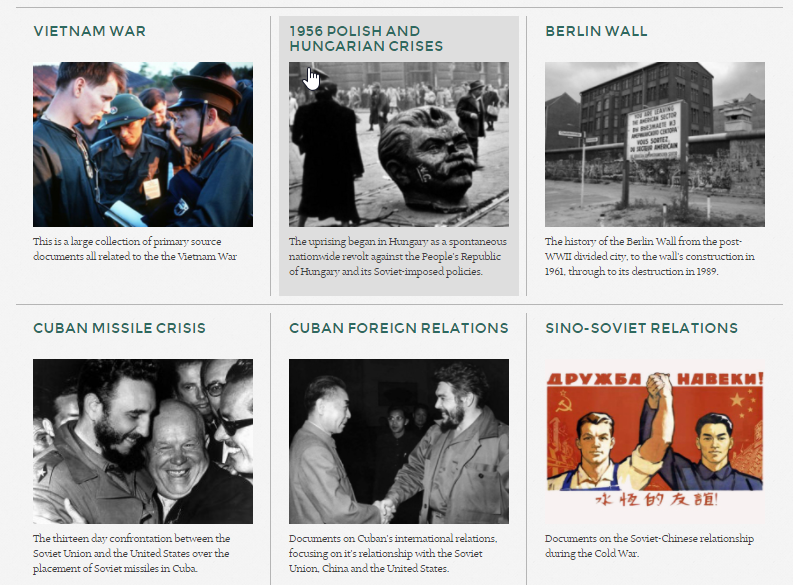 CWIHP has become internationally recognized as the world’s preeminent resource on the Cold War.” The help organize and search the trove of documents, you search using a map, timeline (going back to 1866… great extended context) and contains over 30 featured collections (sample below). This entry was posted in Global Education, History and Social Studies Education, Instructional Practices, Online Education, Uncategorized, Web 2.0. Bookmark the permalink.